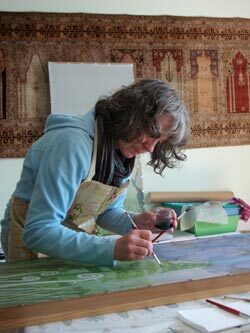 I began silk painting in 1996 and have been gradually learning the skills and techniques required, attending courses at Higham Hall near Bassenthwaite and West Dean College near Chichester with the renowned silk painter, Jane Venables. I have a degree in microbiology and I have had two jobs working in research. However, I knew I would return to some form of textile art at some point, having enjoyed lessons in screen printing at school. My background in science has helped me greatly in my understanding of how silk is constructed and how to dilute concentrated dyes correctly. Silk is a protein, like all the animal-based yarns such as cashmere, angora, mohair and wool. Silk painting is hundreds of years old (like felt-making) and has been practised extensively in Europe as well as Asia. Therefore I feel very much part of a grand procession, this being enhanced by all the skills of spinning, weaving and dye manufacture that have produced the materials I use. The great attraction of working with silk is the vibrant colour of the dyes and the lustre of the fabric. Inspiration for my work comes from the hedgerow, garden and fells and a delight in the colours themselves. I am a member of the Green Door Artists Collective in Kendal, the Ambleside Arts Society, Made in Cumbria and the Guild of Silk Painters.